Eilean Donan Castle is one of the best known and loved castles in Scotland, known across the world and instantly recognisable. It is set in stunning scenery on the West Coast of Scotland and attracts visitors from far and wide all year round. 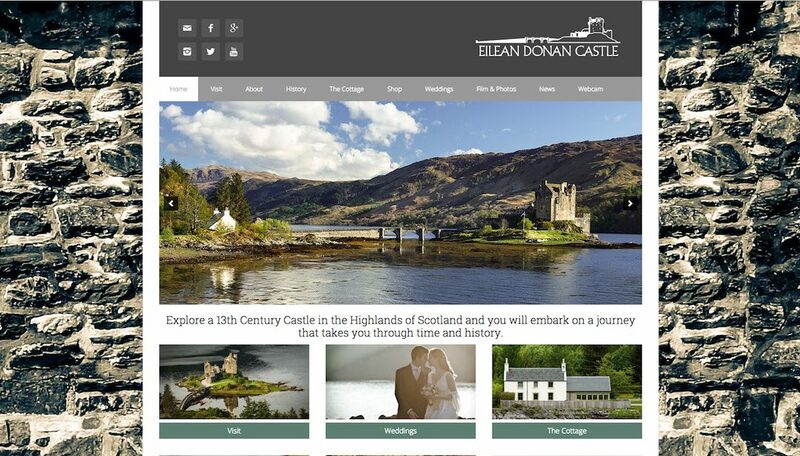 We were delighted to be approached by the charitable trust in charge of the running and preservation of Eilean Donan Castle to design an easy to navigate and mobile-responsive website, using WordPress as a content management system. The clean and muted backdrop ties in with the stonework of the castle which was used as the full page background to provide the perfect frame for the stunning sights of Eilean Donan Castle. The site has many exciting features including a timeline which takes you through the history of the castle. There is a wedding page where you can see previous happy couples and even plan your own special day. The film and photo shoot area details famous films that have been set at Eilean Donan Castle over the decades. The webcam page gives you the unique opportunity to view a live webcam, allowing you to see exactly what’s going on at the castle at all times in all types of weather.